The PCPCC Support & Alignment Network (SAN) supports practice transformation through fostering practice partnerships with patients, families, caregivers and community-based organizations. The PCPCC SAN library includes tools and resources for integrating patient partners into clinical transformation and quality improvement efforts. We start with materials from our SAN Partner organizations, then include links to other high value resources. The PCPCC SAN Resource Library will continue to grow as new tools and information are developed to promote patient and family partnerships engagement as a critical element of practice transformation. Harnessing Evidence and Experience to Change Culture: (Jan 2017) A report developed collaboratively by Planetree and the National Academy of Medicine report; includes discussion of the relationship between engagement and outcomes. Planetree Patient Preferences Passport and Patient Preferences Passport Implementation Guide: (2016) the Passport is a patient activation tool that is used collaboratively by patients and the care team to consolidate health information in the patient's own voice. 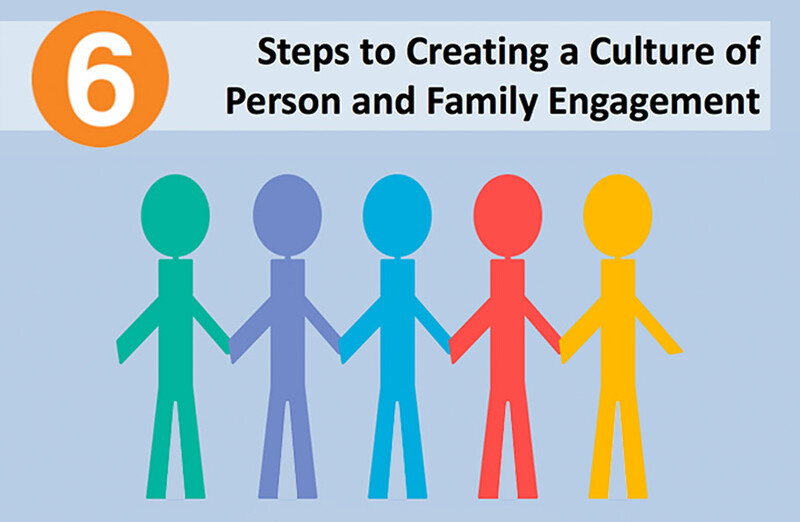 6 Steps to Creating a Culture of Person and Family Engagement: (April 2017) A toolkit developed by Plantree, in partnership with the PCPCC Support & Alignment Network, to support TCPI participating practices in their efforts to improve person and family engagement in all aspects of care delivery. The tools and resources here were shared in PCPCC SAN webinars or are recommended as best practice information. A Roadmap for Patient and Family Engagement in Healthcare (2014) AIR and Gordon and Betty Moore Foundation. This website includes a downloadable “roadmap” publication that includes tactics and practice strategies to help clinicians advance patient and family engagement in healthcare. Person and Family Centered Care Resource Center Institute for Healthcare Improvement. The IHI is a nationally recognized quality improvement organization offering in person and remote education, dedicated to collaborative, team based improvements in health care. A Leadership Resource for Patient and Family Engagement Strategies (2013) Health Research and Educational Trust. This guide provides strategies for leaders to promote culture changes in patient and family engagement. While hospital focused, it is applicable to ambulatory practice. Steps Forward Program. Forming a Patient And Family Advisory Council. An online CME course developed by the American Medical Association Support and Alignment Network. Supporting people to manage their health: an introduction to patient activation (2014). A comprehensive look at the evidence and strategies for using patient activation to improve health outcomes and patient experience. Pediatric Asthma Person and Family Engagement (PPFE) Learning Network: Examined how to use person and family engagement strategies to improve pediatric asthma care and reduce emergency visits for asthma. Peers for Progress: Peers for Progress hosts a learning community to promote peer support as a strategy for patient and family engagement that improves patient outcomes. The site includes training, tools, and information for primary care practices. YMCA Community Integrated Health: The Y is partnering with clinicians at the local level to offer diabetes prevention services and other preventive services to improve health, improve outcomes, and reduce costs. This toolkit is designed for health care practices participating in the Transforming Clinical Practice Initiative, but is of value to any practice seeking strategies to improve person and family engagement. It provides guidance on creating a practice culture that emphasizes and incorporates the patient and family perspective in every aspect of care, to ultimately improve quality of care. This publication was developed as a collaboration between Planetree International and the Patient-Centered Primary Care Collaborative Support & Alignment Network, with assistance from the Institute for Patient- and Family-Centered Care (IPFCC). Below are resources from seminars and trainings, for PAC staff, leaders, and patient advisors at San Francisco Health Network Primary Care. Find more additional information here! This tool is intended to help healthcare organizations improve patient engagement in care redesign. It contains a customizable welcome packet for patients who will be engaged in quality improvement initiatives with health care organizations, as well as a packet for health care team members who will be working with patients in this process. The tools are meant to serve as a starting point for organizations to customize to match their goals, processes, and patient engagement strategies. Read more about and gain access to the toolkit here! This article includes lessons learned, best practices and suggested ways pediatricians can foster these partnerships to enhance outcomes for the children they care for and their families. The TCPI Change Package, which is built on the driver diagram model below, describes the changes needed to transform clinical practice and meet TCPI goals. The driver diagram shows the relationships among goals, the primary drivers that contribute to achieving those goals, and the subsequent factors that are necessary to achieve the primary drivers. Choosing Wisely is a leading effort to encourage conversations aimed at reducing unnecessary tests and treatments in health care. Research shows that when patients are engaged in their health care, it can lead to measurable improvements in safety and quality. To promote stronger engagement, the Agency for Healthcare Research and Quality (AHRQ) is developing a guide to help patients, families, and health professionals in primary care settings work together as partners to promote improvements in care. The Guide to Improving Patient Safety in Primary Care Settings by Engaging Patients and Families is a compilation of evidence-based best practices for improving patient safety through patient, family, and caregiver engagement. This comprehensive guide provides primary care practices with four strategies that they can adopt to improve patient safety. The strategies have pair-tools for clinicians, practice staff, and patients and their families. A practice may choose to adopt one or all of the strategies. Fundamentally, shared decision making is about giving patients the opportunity to be active participants in their health care. When well-informed patients and caregivers team up with health professionals who are trained in effective communication, patients are more likely to receive care that meets their needs and see improved health outcomes. Advocates have an important role to play in ensuring that shared decision-making programs are consumer-friendly. The Mayo Clinic Shared Decision Making National Resource Center advances patient-centered medical care by promoting shared-decision making through the development, implementation, and assessment of patient decision aids and shared decision making techniques. Shared Decision Making (SDM) is a collaborative, patient-directed decision making process that helps Veterans, together with their family caregivers and health care team, set goals and priorities, and make choices that meet patient needs while honoring patient values and preferences. Shared Decision Making is an effective approach for making difficult decisions such as planning for long term care. AHRQ’s SHARE Approach is a five-step process for shared decisionmaking that includes exploring and comparing the benefits, harms, and risks of each option through meaningful dialogue about what matters most to the patient. The National Quality Forum is issuing a call to action for all individuals and organizations that provide, receive, pay for, and make policies for healthcare to embreace and integrate shared decision making into clinical practice as a standard of person-centered care. About this Guide: When patients and families build partnerships with their health care team – such as doctors, nurse practitioners, nurses and clinic staff - to improve health care, everyone benefits! This guide will help you decide if you want to partner with your health care team as an advisor to improve care at your clinic. It also answers questions about the role of patient and family advisors and helps prepare you to participate effectively. 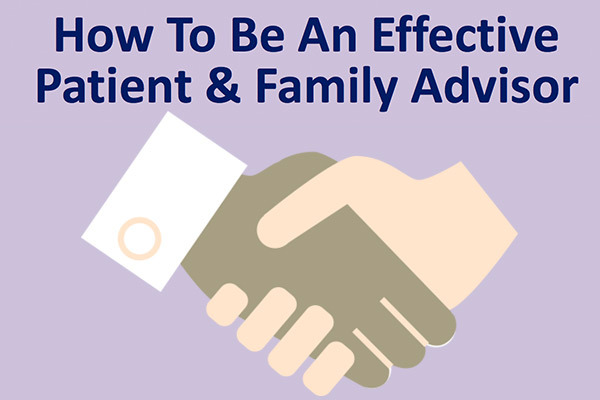 The topics covered in the guide will help you: Learn more about the patient and family advisory role Decide if this is something you want to do Understand how to have a successful experience as a patient or family advisor Find other resources if you want to learn more! Note: This guide may be reproduced by health care providers and clinics using your own logo and contact information. Simply download the editable powerpoint and attach it to the PDF guide without a cover (that is also attached). Mary Minniti discusses how clinicians can use the Patient Advisor Guide! We believe that working with you to improve care at our practice will make the changes made better meet the needs of all our patients and their families. We invite you to consider becoming a Patient or Family Improvement Partner. Sharing your ideas, experience, and opinions helps us think about ways to improve the care experience. There are many different ways or “jobs” that benefit by the insights of people like you. All of them provide you with a chance to work with us to improve care for everyone. This is a template that your practice, clinic, or hospital can use to engage patient and family advisors. What is patient- and family-centered care? Why does it matter? How does it fit with our primary care or ambulatory practice’s overall mission? And finally, what can our clinic do to advance the practice of patient- and family-centered care? Where do we start? Today, leaders, clinicians, staff, patients, and families nationwide are asking these questions. The purpose of this document is to provide some answers. This assessment can be completed by the clinic transformation team or other group which includes administrative and clinical leaders, managers, frontline staff, and patient and family advisors. The group can then discuss responses and develop an action plan. One way to begin working with patients and families in planning for improvement is to explore your primary care setting through the eyes of patients and their families. A “walk-about” is an activity that can be used to obtain patient and family perspectives. One way to begin working with patients and families in planning for improving self- management support is to explore the ambulatory care experience through the eyes of individuals with chronic conditions and their families.